Celebrating three years on the road! It’s hard to believe we’ve been on the road for three years now. It seems like just yesterday that we embarked on this journey to explore our beautiful country on March 1, 2012. How time flies! And here we are three years later, continuing to make wonderful memories along the way. We are pretty much still on track with our set goals, and we picked up 10 new states during the past year. But unlike previous years, our pace slowed down a bit and we stayed longer at most stops throughout the midwest. 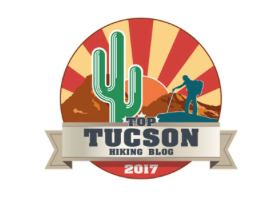 On previous anniversaries I posted about our favorite hiking and biking trails. Alas, we had fewer opportunities for those activities this past year. It’s not that we didn’t stay active, but we just didn’t do enough memorable walks or bike rides to give a useful report. Our actual route followed our planned route fairly closely, including a couple of detours. We began our third year in the Florida panhandle and traveled to our farthest northern stop at Michigan’s Upper Peninsula. Then, back down we went – about as far as you can get in south Texas – for the winter. Along the way, we just had to detour for some time with the birds on our favorite Island at Dauphin Island, Alabama. And even though it was a bit out of the way, our second detour was to have the excellent team at Freightliner do Betsy’s annual maintenance in Gaffney, South Carolina. Looking back at what we endured while at Gulf Shores, Alabama makes us shudder. A five-hour non-stop parade of severe thunderstorms went right over us, with the downpour, winds and thousands of lightning strikes forcing a sleepless night. We got 15″ of rain that day, an all-time record for the area. Being in the middle of an historic storm was not exactly what we had signed on for, but we really had nowhere to run to. We were fortunate to not have any serious damage from that one, because other folks around us certainly did. How can I forget those nasty bites? I was miserable for several weeks from the party those microscopic monsters had on my waist and tummy. Non-stop itching and scratching reddened my skin and was very uncomfortable. Oh my, I’m scratching myself right now just thinking about it! My number one arch enemy, the larvae of a nasty Chigger. Look out you little monster, here comes my finger to crush you! As we hail from California, the Great Lakes were just “big lakes out there somewhere” to us. But after seeing and touching all of them I can easily name them now – with a vivid picture of each in my mind. Now I know that the Great Lakes consist of five separate lakes, and together they form one interconnected body of fresh water. Four of them are bounded by both the U.S. and Canada – Lake Superior, Lake Huron, Lake Erie and Lake Ontario. Only Lake Michigan is entirely within the United States. Who doesn’t want to see a place where a great movie was set? Biking around Mackinac Island was a must for us and our friends, and while there we stopped at the Grand Hotel. That’s where the 1980 film “Somewhere in Time,” starring Christopher Reeve and Jane Seymour, was filmed on location. We just gawked at the grounds and outside of the majestic hotel, as $10 was a bit pricey just to step into the lobby for a picture. 25 years later, the iconic phrases “If you build it, he will come,” and “Is this heaven? No, it’s Iowa.” are not forgotten. We visited the site that made those words famous, the Field of Dreams in Dyersville, Iowa. The cornfields and baseball field were just as they looked in the 1989 movie. To complete our experience, we watched the movies again and commented about how fun it was to be there. Yup, you guessed it – the 630 ft. tall Gateway Arch. It is the monument to memorialize the role of St. Louis in the westward expansion of the United States. Riding to the top of this awesome structure was on our bucket list, and we were amazed by the grand view of the city of St Louis and beyond. You have to see this thing in person to believe it! The south has its own version of Vermont for taking in the fall colors – the Ozark Mountains in Arkansas. If you can’t make it to Vermont for leaf peeping in Autumn, a great alternate would be the Ozarks. Vermont? No, but still gorgeous! Painted Bunting is so darn beautiful! The birding experiences I had during the past year were rich and varied, from Alabama to Wisconsin to Texas. We were very fortunate to be at Dauphin Island, Alabama when spring migration was underway. It seemed to be just raining beautiful birds! At Gulf Shores, Alabama I joined Laurel and Eric to observe bird banding and do some bird watching as well. In Baraboo, Wisconsin I visited the International Crane Foundation, whose stated mission is to work worldwide to save the endangered Whooping Cranes. It was here that I saw all 15 species of cranes in the Gruidae family. 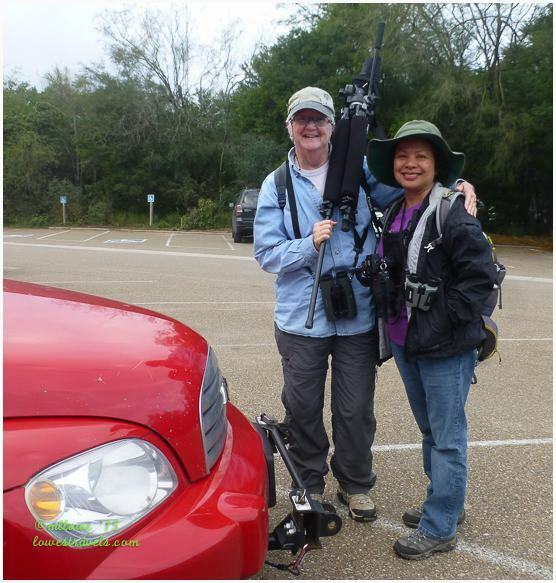 Coastal birding with Ingrid in Port Aransas was so much fun – I think the birds knew our names and tried to hide from us! Then at the birding mecca, also known as the Rio Grande Valley in South Texas, Birdie and I were involved in finding and identifying our feathered friends. Many of them are Texas specialties. We did lots of hikes, but the best of them were in the Great Smoky Mountains and Blue Ridge Mountains in North Carolina. Those mountains provided a beautiful scenic backdrop for some heart-pumping, lung-busting hikes. We’d love to go back there! Family and friends, old and new, always make our journey fun and exciting. Reconnecting with old buddies from my hometown and some of my family is always a joy. Best of all, I got to spend quality time with my super-cute grand niece Hattie in Fayetteville, Arkansas. The connections we made with fellow bloggers continued to flourish. We met new friends Laurel and Eric of Raven and Chicadee; Carla and Jerry of CozybeGone and Faye and Dave of the Wandering Camels. Reuniting with Ingrid and Al of Live Laugh RV and Bob and Susan of Travelbug in Texas was icing on the cake. Bloggers are all fun-loving people who shared travel stories, a few drinks and some home-cooked meals and outdoor activities. Having a grand time with these lovely people created memories that we’ll always cherish. Somewhere, someday we’ll meet again. While in Port Aransas in January, we kept several doctors busy as we were pronounced alive and well. But come February, shortly after our birthdays, I had some scary symptoms that prompted two visits to emergency rooms. For unknown reasons, my blood pressure had spiked like crazy. Much to my disdain, I am now taking daily medication and everything seems to be fine. An eye exam for Steve showed early traces of glaucoma, which was not unexpected since his dad had it when he was in his 50’s. He decided to be proactive and underwent laser surgery. This was the best option for our nomadic lifestyle, since it should lower his eye pressures for quite a while with just daily drops and fewer follow-up appointments. Steve said he’s glad his heart is in good shape, because the medical bills should start coming in any day now! We’re glad to have Betsy and ourselves “good to go”, and excited to start heading back north to get back on track with some serious hiking! Blogging is sometimes a chore 🙂 But with the connections we have made during the past three years, sharing our experiences in the blogosphere is so worthwhile and satisfying. I thank all of our readers and followers who have been with us for the ride. I hope you are still enjoying it, for we are not done yet! Whether you’d like to drop us a line or just read through our stories, we appreciate you stopping by. 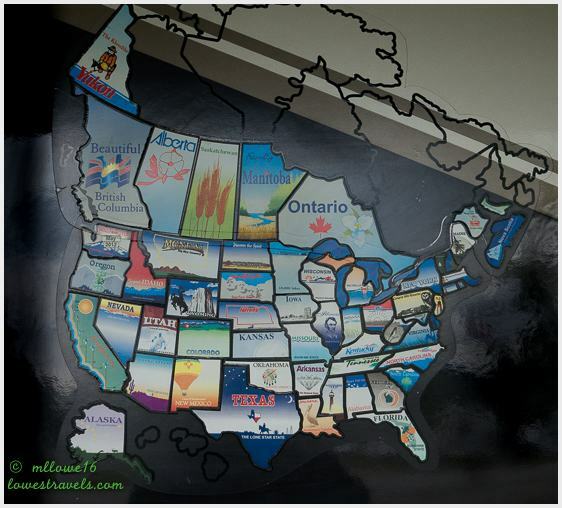 We have 10 states to go, and estimate that we’ll have them all completed by the fall of 2016. Then we’ll start traveling more like “normal” adventurers, taking long trips to places we missed or just want to spend more time at. Next up: Where to in 2015? Our next stop was home to a feature that had long been on our bucket list, and we were able to check it off while in St. Louis. Seeing the 630 ft. tall Gateway Arch come into view for the first time put a smile on our faces, and taking the ride to the top totally made our day. The Arch is located on the banks of the Mississippi River in St. Louis, and it was built as a monument to memorialize the role of St. Louis in the westward expansion of the United States. It is the centerpiece of the Jefferson National Expansion Memorial, which is located at the base of the Arch. To learn about the Arch, we first viewed a 40-minute movie that detailed its construction. The documentary was engrossing to watch, as it showed the overwhelming difficulties of building a curved structure from both ends simultaneously. It’s amazing that no lives were lost, considering the complexity and heights involved. The film also revealed the innovative construction techniques that were employed in the 1960’s on this one-of-a-kind project. Click here for more information and a short animation of the Gateway Arch’s construction. The stainless steel arch is described as a sandwich made of stainless steel on the outside, carbon steel on the inside, with concrete in between them. It is built in the form of an inverted catenary, a shape that a chain or necklace forms when held by the two ends. But of course, the highlight of our visit was the 4-minute tram ride to the 630 ft. peak of the Arch. Look carefully at the image below – the yellow arrow shows where the 16 small windows are on one side at the top. 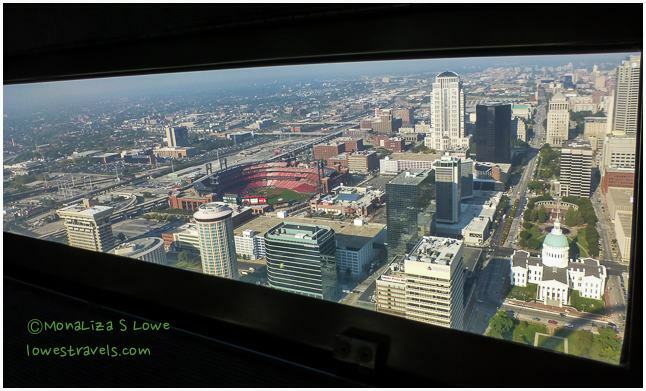 These windows give a fabulous view of downtown St. Louis and beyond from one side of the Arch, and the 16 on the other side overlook the Mississippi River and many miles beyond it. We thought it might be an elevator that would take us to the top, but it was actually a small capsule-shaped transporter that seats five. They call it a tram, and there is one on each end of the Arch (although the north tram was closed for construction work while we were there). The trams run on a track inside the hollow curved legs of the Arch, taking folks to the top in four minutes. It felt like we were riding a slow-motion ferris wheel, except that we were closed inside that small capsule. This would not be a fun ride if you tend to be claustrophobic! Steve is all tucked into his capsule! The views from the top were astounding! It was a strange sensation looking straight down at the ground 630 feet below with no support in the middle. The Arch’s south leg. You can definitely get a bit of vertigo up here! After soaking in the views for a while, we rode back down and this time it was one minute faster – thanks to gravity! 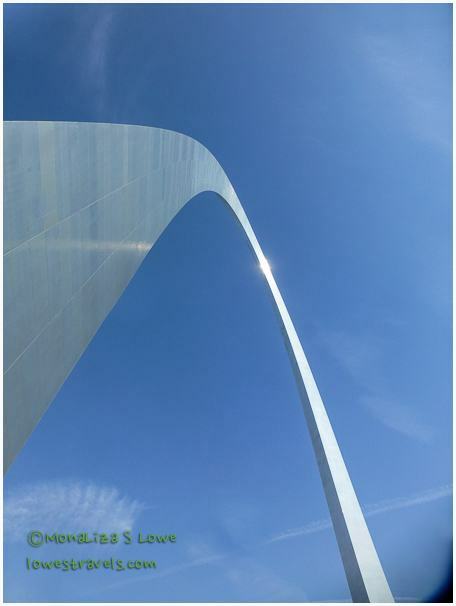 Be sure to make advanced reservations to see the Arch if you plan to go during the busy summer season. We had made reservations well in advance, but it turns out that we probably didn’t need to since we were here well after the kids were back in school. It was great to have the viewing area pretty much to ourselves as we moved back and forth between the viewing windows. Check this one off the bucket list! Beneath the Arch is the Museum of Westward Expansion, which charts the history of the American West from the Louisiana Purchase in 1803 to the closing of the frontier in the 1890’s. Although it was a very informative display with original artifacts, we just skimmed through it as our main goal had been satisfied and we were getting hungry. We enjoyed an excellent sushi lunch at the newly-opened Ballpark Village, located right at Busch Stadium and an easy walk from the Arch. Visiting the Arch and eating sushi on the same day? Steve was ecstatic! Outdoor sushi lunch at the Drunken Fish in Ballpark Village – it doesn’t get much better than this! We have been very happy and impressed while staying at two of Missouri’s state parks – the Dr. Edmund Babler Memorial State Park (our home base while visiting St. Louis, Steve’s review here) and Meramec State Park (review here). With summer over, it’s been a delight once again staying at state parks. Although they still get quite busy on weekends, we have enjoyed being one of the few rigs in the park most of the time. We’re able to use the facilities without running into other people, and the same goes for our hikes on the many nice trails here. And the variety of beautiful birds at Babler State Park! I was happy to refill my feeder every day as we saw so many of our feathered friends fighting for a spot on it. At Meramic State Park we were parked beneath many tall trees. Except for the birds and the rustling of leaves, the silence was deafening. Perfect! Section #1 at Meramec State Park, doesn’t Betsy look lonely out there? Just hubby and I on this 6-mile hike – we never saw another soul! Our two stops in Missouri were a combination of a visit to a cosmopolitan city, followed by getting back to nature while hitting the trails again. Although we had a couple of days of bad weather during these stops, we have to agree that it was “mission accomplished” during our stay in the “Show Me” state.